Difference between revisions of "Manual:Metarouter"
Currently MetaRouter can be used for the RB400 series boards to create virtual machines, but more hardware platforms will be added in future. Each Metarouter instance uses just as much resources as a stand-alone RouterOS installation. This means you need a minimum of 16Mb of RAM for each machine, plus some for the main Router that hosts it. 16Mb is the absolute minimum - it is suggested to have more memory available per each Metarouter. Currently you can create up to 8 metarouter virtual machines, this number will be increased to 16 in future versions. In the main machine, you can create up to 8 virtual interfaces that will be connected to the metarouters. Currently the only way to add more, is to use VLAN. Currently it is not possible to use external storage devices (Store) in the metarouter virtual devices. 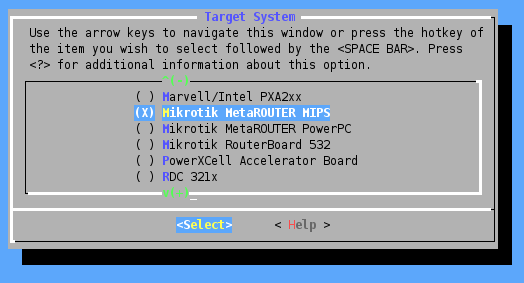 The MetaRouter function is useful for allowing clients or lower-privilege users access to their own 'router' and config to configure as they like, without the need for a complete second router, or giving them access to the main router configuration. For example; a WISP can create a virtual router for the clients ethernet port allowing them to define their own firewall settings, while leaving the WISP's wireless settings untouched. As you can see, creating virtual router is quite easy, you just have to specify name of the router, how many RAM will be allocated for it and disk size that will be used by virtual router. Explanations of all other properties is available in reference manual. Note: * be careful when using dynamic HDD size for metarouters, a proxy could fill up all your hosts storage! Starting from v3.24 and v4.0beta3 MetaROUTER has the ability to import custom built images. As an example we will show how to patch and use OpenWRT as the virtual machine. As you can see OpenWRT is running, now you can start configuration process, which is explained in sections below. Other options depends on what is your requirements (include for example IPv6 and ppp support or not), you can also stick with defaults. It means that required libraries are not installed, check the output and install all required libraries. It will take a while to build everything so you can go and have a cup of tea. After the build process is done, upload newly built image to the router and import it as described in section above. First, you need to add a new interface to your virtual router. This is done in the interface menu. Description of each option can be found in reference manual. Right now you saw that the virtual interface is visible in the Host Interfaces menu as vif1 and also in the metarouter interfaces menu as ether1. You can add an IP address on both interfaces, and set up networking. Creating a bridge between the virtual interface and a physical interface allows traffic to pass. disk-size (unlimited|0..4294967295[kiB] ; Default: unlimited) disk size used by virtual machine. memory-size (16..256[MiB] ; Default: 16) Amount of memory that will be allocated by virtual router. name (string ;) name of the virtual machine. used-disk (integer[kiB] ;) currently used disk space by virtual machine.